Anyone who is a reader of the Cross Rhythms Life pages will know the spiritual wisdom emanating from the heart and mind of American El McMeen while anyone who is a follower of guitar music will know that El is a brilliant virtuoso of his instrument who is listed among the top 100 acoustic guitarists in the world on the digitaldreamdoor website and whose work was described by Guitar Player magazine as "drop dead gorgeous." Elmer Ellsworth McMeen, III was born on 3rd June 1947 in Lewistown, Pennsylvania. He said, "I grew up in small towns in Pennsylvania but was educated and worked in large cities - college (Boston area), law school (Philadelphia and New York City) and law practice (New York City). Those contrasting types of setting undoubtedly influenced me and my perspective on life. Even though I was a partner in a very large NYC law firm for 21 years, I am more comfortable in a small-town setting, with grass and trees (and wild turkeys and the occasional wandering black bear) in our neighborhood here in the northwestern part of New Jersey. My parents were divorced when I was 13. My older sister and I lived with my mother after the breakup. My mother was in the newspaper and broadcasting business." El grew up in a church going environment. He remembered, "My mother was a particularly prayerful and socially aware Christian, and had the distinction of being the first woman elected as a Trustee of the Lutheran Theological Seminary. I myself didn't overtly experience a personal relationship with Jesus as a child; that came later. However, recalling that period, I believe that I would not be alive but for the grace of God, and that he protected me in manifold ways the details of which I will know only when I see the Lord face to face." Through freshman year in college, El played clarinet as a solo instrument, as well as in band and orchestra settings. He studied piano and sang in choral groups. He attended public schools in Lewistown and Huntingdon, Pennsylvania, before attending Mt Hermon School (now called Northfield Mt Hermon School), graduating in 1965. He graduated from Harvard College in 1969 and the University of Pennsylvania Law School in 1972, in each case with Honors. El was an Editor of the University of Pennsylvania Law Review. He married Sheila Taenzler in 1971 and subsequently had three sons and a daughter. McMeen practiced law as his primary vocation in New York City for many years and was a partner in the New York City law firm of LeBoeuf, Lamb, Greene & MacRae, LLP (now called Dewey & LeBoeuf, LLP) for 21 years. 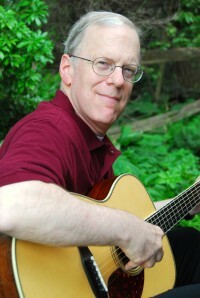 It was on his retirement in 2000 that McMeen began to seriously pursue his guitar playing. He encountered what he saw as an incredible breadth of music that he could try to render on his instrument. He found himself particularly attracted to Irish and Scottish music. McMeen's playing is characterised by melodic emphasis, economy and great beauty of sound. El's natural voice-like phrasing and skill at ornamentation and improvisation create a musical flow that gives the listener the impression he is hearing the piece for the first time, each time it is played. His improvisational approach to pieces creates an atmosphere of warm and personal immediacy. In 1990 McMeen began work on a set of tracks which were to become the 'Of Soul And Spirit' album. He remembered, "I did that CD in sessions of three-hour bites, without editing! I didn't know about editing. I thought I had to play until I got things right. I put a lot of pressure on myself in that respect. I learned about editing later, although when editing capacity was available, I found that I didn't use it all that much. (My new CD 'At-Home Picking And Talking' has only three edits of the guitar music, where I asked my engineer to snip some extraneous sounds.) My 'Of Soul And Spirit' CD was accepted by Shanachie in its 'Guitar Artistry Series'. Stefan Grossman, a great American guitarist and instructor and now a good friend of mine, worked in A&R at Shanachie at the time and was committed to building up the guitar offerings at Shanachie in that period." Another Shanachie album, 'Irish Guitar Encores', followed in 1992 before McMeen established his own record label, Piney Ridge, which has so far released 10 albums by the guitar virtuoso. In 2005 the veteran guitarist had a pivotal spiritual experience. He explained, "In November 2005 I became filled with the Holy Spirit. I experienced the love of God, answered prayer, and the miraculous in my life. That came after much study, prayer, and teaching and was a revelation of the immense love of God for mankind, including me. I have been walking that out ever since." Today El is an elder and co-founder, together with eight other people, of a new Christian, charismatic church called Living Waters Fellowship, in Newton, New Jersey. He said, "I periodically offer soaking guitar music, which the congregation seems to appreciate as a supplement to the contemporary praise and worship music. I am 63 and have scaled back my concerts and traveling. I do, however, like to give workshops and lessons and try to be helpful to and supportive of other guitarists. Currently El's DVD 'Guitar Artistry By El McMeen', distributed internationally through Rounder and Stefan Grossman's Guitar Workshop, is attracting a lot of attention. Said El, "It is my musical legacy, so to speak. It took the grace of God to get me through that video shoot, to be honest, after having had two and a half hours of sleep the night before." I think El is the finest guitarist I have heard. I also appreciate the help and suggestions he has given me as a fellow musician. Thanks for this great article. He is a fine Christian man and a wonderful musician. Acoustic guitar player El McMeen releases 'Amazing Grace' album.